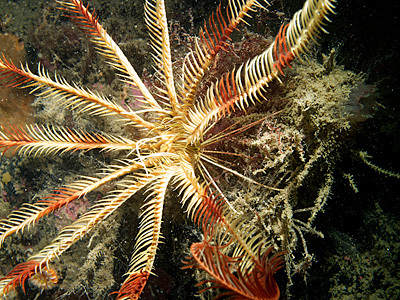 ECHINODERMATA : COMATULIDA : Antedonidae STARFISH, SEA URCHINS, ETC. 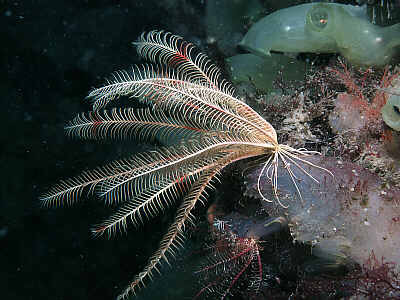 Description: This feather star has ten pinnate arms with neatly held side branches. The cirri on the underside of the disc are long and pure white in colour. The arms may be banded in red and white or plain coloured in brown, white or red. In areas of moderate current specimens have been observed to spread their arms out into a vertical fan across the current. Antedon at the same site were not showing this behaviour. Arms typically 7-10cm in length. 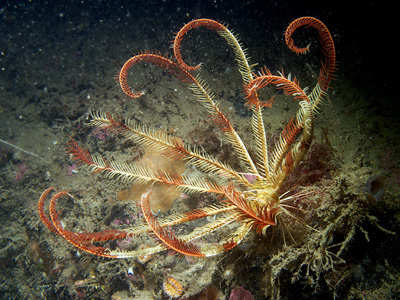 Habitat: A deep water form which has recently been discovered in water as shallow as 20m in sheltered localities and sea lochs. Distribution: In shallow water only known from the west coast of Scotland. Similar Species: Probably frequently mistaken for Antedon bifida or Antedon petasus. Ten large neatly held pinnate arms. Long white outstretched cirri of 40-50 joints. Picton, B.E. & Morrow, C.C. (2016). Leptometra celtica (Barrett & McAndrew, 1858). [In] Encyclopedia of Marine Life of Britain and Ireland.